Saratoga's Dernie Wang finished 20th overall and second for the Falcons in last week's league meet at Crystal Springs. Wang's effort helped the Falcons clinch a team third behind powers Los Gatos and St. Francis. No one could keep up with Los Gatos at the cross country finals in the De Anza Division of the Santa Clara Valley Athletic League on Halloween Day. But while the Wildcats were completing the trick of winning three of five league championships and finishing second in the other two divisions, there were plenty of treats to go around for the other teams in the De Anza Division field. Saratoga finished second to Los Gatos in two races and added an impressive third in the girls varsity division behind the Wildcats and St. Francis, and Lynbrook managed to win a team title in the boys junior varsity race. What's more, Saratoga and Lynbrook each had runners place among the top 10 in varsity competition. Senior Jacob Christopherson and junior David La of Saratoga, and junior Jeff Whitsett of Lynbrook each won all-league honors by placing in the top 10 in the boys varsity race. Christopherson covered the 2.95-mile course at Crystal Springs in Belmont in 16:37 to finish fifth overall and lead the Falcons to a team second behind the Wildcats. Gatos ran up a low 17 points to win the team title, but Saratoga was a solid second with 61 points. La was 10th overall in 17:33 for the Falcons with Brett Stanger 11th (17:39), Richard La 16th (17:47) and Donald Prolo 18th (18:12). Whitsett starred for the Vikings at the finals, running sixth in 16:49. Matt Meyer was 24th (18:45) for the Vikings with Ryan Deal 26th, Daiki Kuwahara 27th and Ken Chung 39th. Los Gatos and St. Francis dominated the girls varsity race, combining for eight finishers in the top 10 to finish 1-2 in the team poll. And it was Saratoga running third as a team to the Cats and Lancers. "It was a great come-through performance for the girls," said Saratoga coach Marshall Clark. "They beat two teams that just last week finished in front of Saratoga at the Lynbrook Invitational." 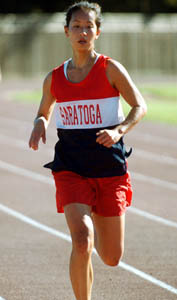 Joanna Burgess led the Saratoga effort, finishing 14th in 21:19. Dernie Wang was 20th (21:57) with Paula McNally 22nd (22:17), Carol Liu 24th (22:26) and Laura Lin 25th (22:29). Sophomore Francine Lee and freshman Sasoon Kim of Lynbrook also impressed at the finals be finishing the top 20 overall. Lee was 13th in 21:11 for the Vikings with teammate Kim 18th in 21:35. Soph Hyan Kim was 21st for the Vikes in 22:11. Saratoga was second to Gatos in the boys junior varsity race. Ian Kolb was fourth in 18:58 to lead the Falcons with Clarence Tam ninth, Takashi Tomanaga 12th, Tony Yiu 14th and Devin Lui 16th. Casey Courtney of Lynbrook finished eighth in 19:32 with Calvin Wu 13th and Chris Lum 15th. Freshman Chris Deal was first in 18:00 to lead the Lynbrook boys frosh-soph team to a league championship. Eugene Berson was second in 18:04 with Morgan Katz eighth in 19:11, Jason Whitsett 11th in 19:18 and Allen Chang 17th in 20:04. All five runners are freshmen. Saratoga's Jacob Osborn was sixth overall in 18:58. Daniel Yang was 10th for the Falcons with Steven Surrette 14th, Aritoki Suzuki 28th and Lawrence Hui 32nd. In the girls JV division, Los Gatos and St. Francis dominated the top 10. Amber Ju was 21st for Lynbrook with Linda Hung 27th. Daphne Lo was 29th for Saratoga with Jackie Molzon 32nd, Priya Talreja 35th, Mary Elliott 39th, Kate Boehm 40th and Stephanie Morrison 41st. A week earlier, runners sloshed through the mud in the annual Lynbrook Invitational, a 2.1-mile jaunt across the school's Johnson Avenue campus. The race began with a shower creating a muddy course for the runners in the varsity boys division. But a downpour during the girls race left the terrain difficult for the rest of the field. "The varsity boys race started off under muddy and slick conditions with a slight drizzle," said Lynbrook coach and race director Hank Lawson. "Midway through the varsity girls race the downpour began--and never let up. By the time the junior varsity boys toed the line, you couldn't even see the track [under inches of water]. The JV girls finished the day needing a paddle in order to finish." "That was the most rain I have seen during a cross country meet in over 40 years," added Saratoga's Clark. Christopherson of Saratoga and Jeff Whitsett of Lynbrook managed solid efforts, in spite of the conditions. Christopherson was fourth in 11:09.8 and Whitsett was close behind in fifth in 11:29.4. C. Deal raced home in ninth in 11:45.2 and R. La of Saratoga gained a place in the top 10, finishing 10th in 11:48.6. D. La was 11th in 11:49.8. Stanger was 14th in 12:01.7 with Justin Gardner 20th in 12:31.3 to round out the top five for the Falcons, who finished second to Wilcox in the team standings. Kolb (21st in 12:32.2) and Trevor Adams (22nd in 12:33.7) were other top finishers for Saratoga. Berson was 15th in 12:14.8, Kuwahara was 17th in 12:26 and R. Deal was 24th in 12:44.4 to help Lynbrook to a third-place finish overall. Despite the downpour that began a little later in the day, Monta Vista junior Megumi Takahashi romped to an individual victory, covering the wet course in 13:45.7. Takahashi led the Matadors to the team title with her individual performance. F. Lee finished third overall in 14:20.2 to lead host Lynbrook to a team second. H. Kim was fourth in 14:30.6 with S. Kim seventh in 14:38.6, soph Jessica Ignaitis 15th in 15:13.3 and soph Kate Bossange 21st in 15:31.9. Saratoga finished third as a team in the girls race. Burgess was sixth in 14:35.1 with Paula McNally ninth in 14:47.1, Wang 11th in 14:50.4, Liu 14th in 15:06.7 and Lin 19th in 15:25.9. The conditions worsened as the JV boys took to the course. Jacob Osborne of Saratoga was fourth in 13:10.7. Lynbrook's Matt Meyer, Morgan Katz, Jonathan Choi and Ken Chung finished six through nine with Casey Courtney 11th to help the Vikings clinch the team title. Saratoga's Takishi Tomonaka (13th), Daniel Yang (15th), Clarence Tam (17th) and Steven Surrette (20th) rounded out the top five for the Falcons. The heavy rain and muddy conditions couldn't keep the JV girls off the course for the final race of the day. Morrison was seventh for Saratoga with Judy Wang ninth, Talreja 14th, Boehm 15th and Molzon 16th. Jessica Gall was 10th for Lynbrook with Linda Hung 11th and Amber Ju 12th. Danielle Zelinski of Prospect finished among the leaders in the girls division when the Blossom Valley Athletic League held its cross country finals on Oct. 30 on the 2.95-mile course at Crystal Springs in Belmont. Zelinski, a junior, finished third in 19:38, running behind only Kristen Funck of Piedmont Hills (18:57) and Allison Stiller of Leland (19:00). Zelinski led the Panthers to a team 12th at the BVAL meet. She was supported by sophomore Edina Hamulie, who was 39th in 22:49; junior Michelle Holleran, 62nd in 23:35; senior Natasha Flowers, 86th in 24:27; and junior Nicole Sterns, 102nd in 25:20. Jasman Wynne-Evans led the Westmont effort at the league meet. The junior finished 40th in 22:51. Rounding out the list of finishers for the Warriors were senior Jessica Davis (23:47), junior Allison Smith (25:33), junior Becky Aguirre (29:13), freshman Robin Smpiel (29:13) and senior Magan Smpiel (29:26). In the boys division, Jon Gire of Silver Creek covered Crystal Springs in 16:14 to win the overall title. Junior Kevin Willis of Westmont finished strong, nailing 22nd place in 17:18 to lead Westmont to an 11th-place finish in the team standings. Prospect senior Joshua Miner was 25th overall in 17:20, leading the Panthers to 14th in the team poll. Supporting Willis' effort for Westmont were Anthony Salazar, a sophomore who was 63rd in 18:36; Patrick Netter, a senior who finished 69th in 18:47; Jordan Lee, a senior who was 73rd in 18:53; and freshmen Justin Mitchell (86th in 19:20) and Andrew Tupper (87th in 19:20). Junior Ibrahan Jama was 74th for Prospect in 18:54 with juniors Matt Fischer (19:25) and Anthony Lin (19:29) close beind. Sophomore Scott Smith (19:31) rounded out the Prospect top five.